* For an updated list of upcoming events, visit our calendar or our FaceBook page. Candidate Forums: Rantoul March 14th, 2019. Video of these forums is available here. On Tuesday, May 29th, LWVCC will team up again with Moms Demand Action to discuss the organization's intiative, The Everytown Survivor Network. The Everytown Survivor Network, an initiative of Moms Demand Action, exists for the main purpose of bringing survivors of gun violence together to build a community of support. These survivors say it is a powerful experience to meet, share their personal stories, and advocate alongside other survivors because they understand and care for one another in a unique way. Hear more about this organization and share the stories of local residents who have lost a family member or a friend to gun violence. The spokesperson for the group is Janice Walker, the lead in this initiative. She will be accompanied by Pastor Patricia Havis of St. Luke's of Champaign and by Vivian Biggers Tuell. Everyone is invited to attend the meeting on Tuesday, May 29, at 6:30-7:30 in the Lewis Auditorium at the Urbana Free Library. 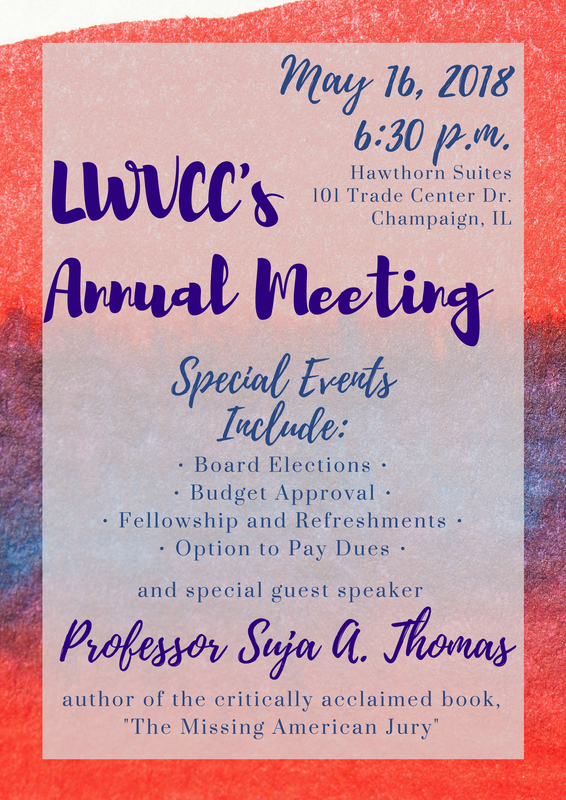 Join LWVCC for its annual meeting. Every year, in lieu of a general lunchtime meeting, the League hosts a May meeting in which the board is elected, the budget is approved, and members and prospective members have an opportunity to mingle and network. All are welcome, so please invite friends to come learn more about League! There is plenty of free parking on the back side of the Hawthorn building (the State Street side) right across from the conference center entrance. In the attached map, everywhere in green is safe to park! Last Fall, LWVCC hosted a meeting about gun control in the community. On Tuesday, April 17th, LWVCC will be hosting a "spin-out" meeting regarding gun violence with Moms Demand Action, a group that strives to spread knowledge about the adverse effects of gun violence and how to avoid them. Focus of the Meeting: Jen Straub is the local group lead for Moms Demand Action for Gun Sense in America. She will discuss the history of Moms Demand Action, their national work in gun violence prevention, national and state legislation, and their work locally with other gun violence prevention efforts. This event is hosted by LWVCC, and we would like to welcome members to attend the presentation. Controlling gun violence is part of today's national dialogue, and this is an opportunity to unite the League's efforts with those of Moms Demand Action in a common cause. Join us on Wednesday, March 21st at noon for our annual Observer Corp Meeting! At this meeting, current Observers will discuss what they have found thus far at the meetings they attend. Not only does attending this meeting shed light upon the happenings of a wide spread of community organizations, but it also serves as an excellent opportunity to learn more about the Observer Corp if you are interested in volunteering as an Observer. Thanks to all of those who moderated or ushered, and another special thanks to those who came and asked questions! If you missed our November meeting, please check it out below! LWVCC was excited to host a discussion regarding the effect of the Opiate Crisis in Champaign County. The Opiate Crisis, which has a disproportionate effect on rural communities, has been strong in discussions at the national level but much remains to be said about its effects in specific communities. Discussing the effects of opiate addiction were Julie Pryde, Director of the Champaign County Health District, and Deputy Sheriff Allen Johnes of the Chapaign County Sheriff's Department. Read the document below to learn all about LWVCC's October happenings! Did you miss the meeting? No problem! Watch the video below to catch up on what you missed, and be on the lookout for subsequent small group meetings on the same topic! Thanks, UPTV for making the content available! CU Moms Demand Action for Gun Sense in America, one of the presenters at our September meeting, provided her presentation for publication on our website. Read below to find statistics on gun violence, information about the organization, and ways you as an individual and community member can help. The 2017 Inaugural Voter is Out! This year, LWVCC decided to release a special-edition Newsletter publishing a report from each volunteer observer. LWVCC Observers are an essential part of our organization, as they learn first-hand what is happening in the Champaign-Urbana community by sitting in on community and government boards. Read and learn! Looking for a way to stay involved with LWVCC this summer? Volunteer to help register new voters and spread the LWVCC word at the Urbana Market at the Square on July 8, Sept. 2, or Oct. 7! Sign up ﻿﻿﻿here﻿﻿﻿! Jean Burkholder, an esteemed, long-time member of the Champaign County chapter of the League of Women Voters, passed away peacefully Monday, June 12th. Please take the time to read about Jean's many accomplishments, published in the News Gazette here. Jean's work as chair of the Committee on Housing was invaluable in shedding light upon housing conditions in our community. We are honored as an organization to have been affiliated with Jean, and hope that our members continue her legacy of commitment to the community. LWVCC participated in what will be considered monumental in history – the global Women's Marches. Although the march started as the Women's March on Washington, the idea quickly spread throughout the country to include communities nationwide and internationally. The local march in Champaign had estimates of 5,000 people marching to stand up for women's rights and equal justice. Thanks to the League members that marched with LWVCC! Happy New Year from LWVCC! We hope that you had a great celebration of the end of 2016 and beginning of 2017. Here are some highlights from 2016. Thank you for visiting our new website. We hope you find it useful and intuitive. If you notice any issues, please e-mail us at webmaster@lwvchampaigncounty.org.